This piece by former Senator John Wallace is part of a series about the renewed Senate by former Senators. John Wallace served as a Senator for New Brunswick for eight years. Appointed as a Conservative Senator in 2009, he chose to leave the caucus to sit as an independent in 2015 until his retirement in 2017. John Wallace served as a Canadian Senator from 2009 to 2017. As requested, I offer my following personal thoughts on how the Senate’s current modernization process may achieve its objective of creating a less partisan, more independent, accountable and transparent Parliamentary Chamber. At the outset, I do wish to once again point out and acknowledge that this particular process of Senate modernization began as a direct result of initiatives that were undertaken in 2014, by our esteemed colleague and former Speaker of the Senate, the late Honourable Senator Pierre Claude Nolin. 6) Promoting and Defending Caucuses that Concern the Public Interest. Without doubt, the numerous contributions of the late Senator Nolin for the direct betterment of the Senate of Canada, and its members, cannot be over-stated and should not be forgotten. All successful applicants are required to acknowledge and confirm that they will carry out their senatorial duties and responsibilities in a truly independent, non-partisan manner. This requirement to always act in an independent, non-partisan manner is of course, both fundamental and absolutely necessary for the proper performance of the Senate’s primary legislative role, which is as “a complementary legislative body of sober second thought,” as was confirmed by the Supreme Court of Canada in its 2014 decision in Reference re Senate Reform. The framers of the Constitution sought to endow the Senate with independence from the electoral process to which members of the House of Commons were subject, in order to remove Senators from a partisan political arena that required unremitting consideration of short-term political objectives. By so doing, they were clearly differentiating and distinguishing the required Constitutional roles and responsibilities of Senators, from those of elected Members of Parliament. In my opinion, and the opinions of many others, that failure was the direct result of the long-standing prevalence and practice of excessive political partisanship from both sides of the Senate Chamber. This is not, and cannot be the right answer for a properly functioning Canadian legislative chamber of sober second thought. The Senate’s fundamental legislative role should always be performed on the basis of objective, merit-based public policy considerations and decision making that represents and reflects the best interests of Canadian citizens, and is not based on a predetermined, political bias that is clearly one-sided, lacks impartiality and reflects the best interests of political caucuses. This historical practice by Senate partisans of consistently “voting the party line” and choosing, for the most part, to act as “rubber-stamp agents” of the political will and direction of their respective political caucuses, obviously lacked impartiality and seriously eroded the credibility and reputation of the Senate. The Senate was not created with the intention that it be the “mirror image” or “rubber stamp agent” of the House of Commons, quite to the contrary. The current practice of having Senators who are members of the Independent Senators Group sponsor Government bills in the Senate, should be discontinued. The role and expectation of a sponsoring Senator is that they must act as the agent for the government in getting the bill passed. From considerable first-hand, past experience, I am well aware that doing so requires a sponsoring Senator’s direct involvement in the government’s strategic policy and political considerations that are relevant to the bill in question. In those circumstances, I believe the sponsoring Independent Senator is clearly in both a real and publicly perceived conflict of interest that prevents them from acting, and being seen as acting, in “a thoroughly independent” manner. The responsible Minister, Deputy Minister or Parliamentary Secretary, as is presently the case with Government bills when they are presented to the appropriate Senate Committee for review, study and report. The Senate of Canada is a self-governing body in which Senators establish the rules that apply to themselves (this includes of course, Senators’ expenses), with authority to make final decisions on how and when those rules are actually applied. The ultimate authority on Senators’ expenses is the Senate Committee on Internal Economy, Budgets and Administration (CIBA) and as has been consistently stated and acted upon by Senators over the years, and particularly so by those in positions of leadership within CIBA: “We are masters of our own House.” That refrain may have been appropriate and publicly acceptable 150 years ago, but not in this current day and age. Those of us who were members of the Senate at the time, vividly remember the exhaustive audits of all Senators’ offices that were conducted by the Auditor General, and the result of which was the “Report of the Auditor General of Canada to the Senate of Canada” in June 2015. To say that was somewhat less than a stellar experience for the Senate institution, and its individual Senators, would be a gross understatement. The total public expense incurred for this Senate audit was in the $24-million range and the Auditor General identified 30 Senators, including leaders of the Conservative and Liberal Senate caucuses, who had submitted claims for expenses that were found by the Auditor General not to be for allowable “parliamentary expenses, and consequently the Auditor General required these amounts to be repaid. There were some positives, however, that arose from the Auditor General’s audits, and particularly so those that can be found within the “Findings” and “Recommendations” sections of his report. What is, or should be obvious to all, is that in this current day and age the Senate’s refrain that “we are masters of our own House” rings extremely hollow, is totally insensitive and out of step with reasonable public opinion and expectations regarding the spending of taxpayer dollars and furthermore, is indicative of a lack of full appreciation and understanding of the need for significantly increased public accountability in this regard by the Senate as a founding institution of our Canadian Parliament. This need for increased public accountability could not have been made clearer by the Auditor General within the findings and recommendations of his report. The report clearly calls for the creation of an “independent oversight body,” the majority of whose members, including its chair, is independent of the Senate. My understanding is that the Senate has not implemented this particular recommendation. That is the wrong conclusion. Without that change occurring, plays directly into the negative perception of those of the general public who regard the Senate as a self-protecting club of privileged elites, that above all else and at considerable public expense, looks after its own interests. The Senate should not be tone deaf to what led up to the audit by the Auditor General, the public’s reaction and legitimate concerns that were clearly expressed at that time. Now is not the time for half-way measures in attempting to adequately address these issues. 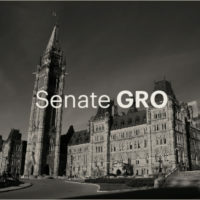 To this day, the Senate continues to take the position that with the self-protection of “parliamentary privilege,” it has the exclusive right to discipline its members and invoke administrative penalties, including the withholding of pay, without the possibility of judicial review by our Canadian courts and the application of relevant Canadian law, including the rights and protections provided for under Charter of Rights and Freedoms. The Senate’s position on this issue is entirely contrary to, and violates the basic principles of Canadian justice that require the fair and equal treatment of all Canadian citizens. Those basic principles continue to be the basis of the democratic system of this country in which each of us live. It is inconceivable, to me at least, that in this current day and age, a situation like this could be allowed to continue to exist within, of all places, one of our own founding Parliamentary institutions. 2) The Senate adopt the recommendations of the Auditor General with respect to the establishment of an independent oversight body, the majority of whose membership should be independent from the Senate. As we are all well aware, Senate committees regularly conduct and produce excellent, high quality studies and reports, covering a broad range of topics that are highly relevant and of great interest to many Canadian citizens, organizations and businesses. In recent years, the Senate has made the work of committees more publicly accessible, however I believe there is still more that needs to be done. In order to improve the effectiveness and relevance of the Senate for the benefit of the general public, and in doing so enhance transparency within the institution, I believe additional improvements should be implemented that would significantly increase the public’s awareness of, accessibility to, and potential use of all of the information, findings and conclusions that are contained within each these Senate Committee reports and studies. To accomplish this, I would recommend that all of the contents contained within each of these reports and studies be made electronically available to the general public, in Google-like fashion, by being able to reference and access all desired information by topic/subject matter, key words and phrases and statutory sectional references, as well as report/study names, committee names, names of participating Senators and witnesses, etc. In this way, the investigative work of the Senate could become a far more valuable resource and research reference tool for the use and benefit of all Canadians, including members of the media. In conclusion, I do hope that these thoughts I have expressed will be of some use and benefit to Senate members in their present and future deliberations on Senate modernization. The Senate of Canada continues to remain very much in my thoughts.